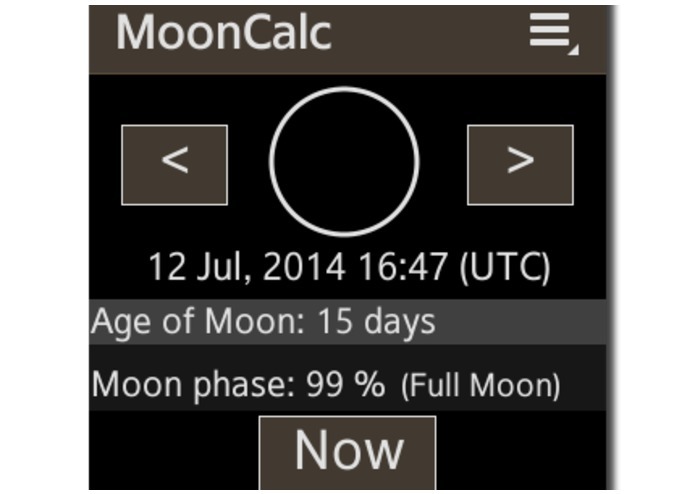 The MoonCalc Gear Web App for calculating Age of Moon and Moon Phase. For residents of the Northern Hemisphere. And drawing current phase of the Moon. The current version (Moon Calc Gear App v1.0) use the standalone type. Therefore, not required a general host application, and can operate independently. 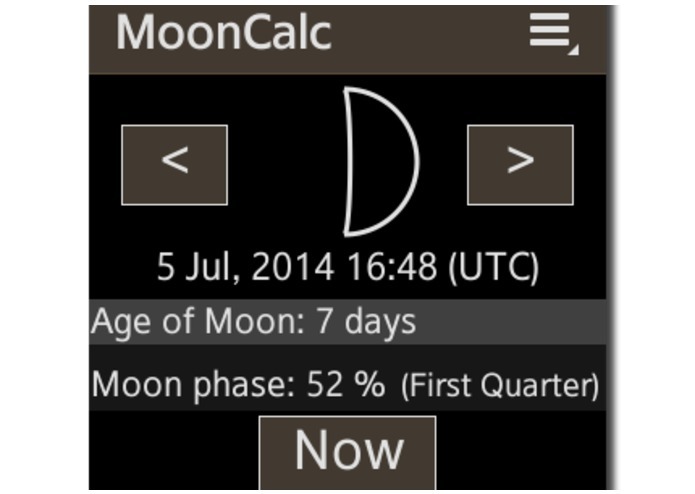 The MoonCalc is the popular Web App, developed by our team for several years for devices running on various mobile platforms (Google Android, Samsung bada, Nokia S40, Nokia Asha Software Platform, Symbian OS, Nokia X Software platform etc.). The MoonCalc Web App was downloaded more than 100,000 times by users from 186 countries of the whole world. When developing the MoonCalc Gear Web App have been completely revamped design, functionality and mathematical model of the application taking into account specific features of the Samsung Gear 2 device. For example, when displaying the current phase of the Moon instead of the bitmap image on the HTML 5 Canvas formed a vector image. What, in our opinion, is more consistent with the style of design the Samsung Gear 2 device. In the current version of the MoonCalc Gear Web App is not using geolocation, and the image of the current phase of the Moon is displayed only for residents of the Northern Hemisphere. In new versions of this functionality is planned to be extended. Our team tried to create interesting and useful Web App that will be indispensable for users Samsung Gear 2. Co-Owner and managing partner of A.V.T.